Mendenhall Glacier information, tours and shuttles. Mendenhall Glacier in Juneau Alaska. The great Mendenhall Glacier is known as the most visited glacier in all of North America. The abundance of visitors in no way makes the scenery less incredible. The reason it's so frequented is its grandeur, as well as its location being so close to the city of Juneau. You can nearly drive up to the immense blue ice flow. The Mendenhall is an inland glacier, located about nine miles (14 km) from the ocean. Connecting the glacier to the sea is the Mendenhall river, allowing silty glacial meltwater to spill out into the ocean. At the base of the glacier is the enormous Mendenhall lake, where the glacier immediately melts and calves into. The glacier is retreating, meaning that it is melting faster than it is flowing forwards. As a result a large basin of water has collected at the terminus of the glacier. This lake is thought to have formed in the last eighty years. It is about 2.5 miles across and two miles deep. The beautiful lake and its marvelous iceburgs are largely what make this glacier so fascinating to view. The Mendenhall glacier is thought to have retreated about a half mile (or 660 meters) in the last 20 years. Glacierchange.org shares a fascinating image of the glacier's terminus, documenting its visual retreat in just the last three years. When visiting the glacier one will notice how grey the lake's color is. The reason for this low visibility is that the lake is filled with silt, or ground rock bits. As the glacier forms and flows it grinds all of the rock in its path. Then, when the glacier melts, the fine rock pieces cloud the melted ice lake. The mineral-laden water soothes the skin, but if you choose to wash your face in the lake, remember that the water is just a few degrees above freezing! All those who visit the glacier marvel at the ice's deep blue coloration. The reason the ice is so blue is that it is extremely dense, moreso than an ice cube. Thousands of years of accumulation and gravitational pull are responsible for this increased density. The ice crystals are packed so tightly together that all air bubbles have been squeezed out. Air bubbles typically allow absorption of all of the colors in the light spectrum. Without air, the ice absorbs all but the blue color from sunlight which it instead reflects, creating the spectacular blue coloration. 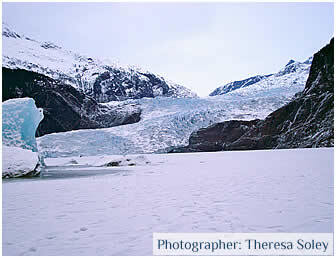 There are numerous ways to visit the Mendenhall Glacier. The most cost-effective way is to take the Blue Glacier Express bus to the glacier for $16.00 per person round-trip. This bus will bring you from downtown, where cruise ships port, to the Mendenhall Glacier Visitor Center where you have a wonderful view of the glacier. Inside the center you can learn about the power of glaciers and speak with experts. Also near the center are a variety of well-maintained trails of all levels. You can choose a twenty minute to two-hour trail with glacier views. Gastineau Guiding and Above and Beyond Alaska offer guided hikes around the Mendenhall. You can also book a glacier and whale watching trip through these companies. 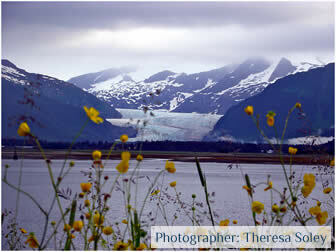 Another more physical option is to view the glacier from the Mendenhall Lake. One can either float down the river on a raft or canoe across the lake. Alaska Travel Adventures offers these trips. 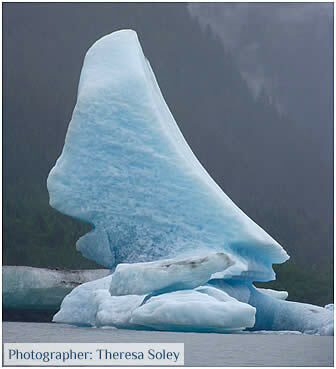 The large canoes that weave through floating iceburgs and towards the glacier's face is a highly recommended trip. This is the closest you will get to the Mendenhall glacier! The raft trip doesn't bring you as close to the glacier, but rather downriver towards the ocean. Another option for adventurous travelers is to rent kayaks and paddle independently on the Mendenhall Lake. This paddling trip is recommended for experienced kayakers, as the lake water is cold as ice and kayaks can sometimes turn, leaving paddlers stranded in the middle of the lake. No matter how you choose to experience the glacier, the Mendenhall will leave you in marvel at the power of ice. Blue Glacier Express - tour bus to Mendenhall Glacier. Mendenhall Glacier Visitor Center located at Mendenhall Glacier with views and information available. Gastineau Guiding - guided hikes around the Mendenhall. Above and Beyond Alaska - guided hikes around the Mendenhall. Alaska Travel Adventures - canoe trips on Mendenhall Lake. Beyond AK - kayak rentals on Mendenhall Lake.